This is an old revision of this page, as edited by Robertgombos (talk | contribs) at 12:30, 30 August 2018 (+gf (m. grp)). The present address (URL) is a permanent link to this revision, which may differ significantly from the current revision. For other uses, see Furniture (disambiguation). People have been using natural objects, such as tree stumps, rocks and moss, as furniture since the beginning of human civilisation. Archaeological research shows that from around 30,000 years ago, people began constructing and carving their own furniture, using wood, stone, and animal bones. Early furniture from this period is known from artwork such as a Venus figurine found in Russia, depicting the goddess on a throne. 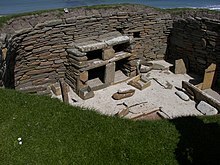 The first surviving extant furniture is in the homes of Skara Brae in Scotland, and includes cupboards, dressers and beds all constructed from stone. Complex construction techniques such as joinery began in the early dynastic period of ancient Egypt. This era saw constructed wooden pieces, including stools and tables, sometimes decorated with valuable metals or ivory. The evolution of furniture design continued in ancient Greece and ancient Rome, with thrones being commonplace as well as the klinai, multipurpose couches used for relaxing, eating, and sleeping. The furniture of the Middle Ages was usually heavy, oak, and ornamented. Furniture design expanded during the Italian Renaissance of the fourteenth and fifteenth century. The seventeenth century, in both Southern and Northern Europe, was characterized by opulent, often gilded Baroque designs. The nineteenth century is usually defined by revival styles. The first three-quarters of the twentieth century are often seen as the march towards Modernism. One unique outgrowth of post-modern furniture design is a return to natural shapes and textures. The English word furniture is derived from the French word fourniture, the noun form of fournir, which means to supply or provide. Thus fourniture in French means supplies or provisions. The English usage, referring specifically to household objects, is specific to that language; French and other Romance languages as well as German use variants of the word meubles, which derives from Latin mobilia, meaning "moveable goods". The Seated Woman of Çatalhöyük statue is evidence that furniture existed in the neolithic. The practice of using natural objects as rudimentary pieces of furniture likely dates to the beginning of human civilisation. Early humans are likely to have used tree stumps as seats, rocks as rudimentary tables, and mossy areas for sleeping. During the late palaeolithic or early neolithic period, from around 30,000 years ago, people began constructing and carving their own furniture, using wood, stone and animal bones. The earliest evidence for the existence of constructed furniture is a Venus figurine found at the Gagarino site in Russia, which depicts the goddess in a sitting position, on a throne. A similar statue of a Mother Goddess was found in Catal Huyuk in Turkey, dating to between 6000 and 5500 BC. The inclusion of such a seat in the figurines implies that these were already common artefacts of that age. A range of unique stone furniture has been excavated in Skara Brae, a Neolithic village in Orkney, Scotland. The site dates from 3100–2500 BC and due to a shortage of wood in Orkney, the people of Skara Brae were forced to build with stone, a readily available material that could be worked easily and turned into items for use within the household. Each house shows a high degree of sophistication and was equipped with an extensive assortment of stone furniture, ranging from cupboards, dressers and beds to shelves, stone seats, and limpet tanks. The stone dresser was regarded as the most important as it symbolically faces the entrance in each house and is therefore the first item seen when entering, perhaps displaying symbolic objects, including decorative artwork such as several Neolithic Carved Stone Balls also found at the site. Ancient furniture has been excavated from the 8th-century BC Phrygian tumulus, the Midas Mound, in Gordion, Turkey. Pieces found here include tables and inlaid serving stands. There are also surviving works from the 9th-8th-century BC Assyrian palace of Nimrud. The earliest surviving carpet, the Pazyryk Carpet was discovered in a frozen tomb in Siberia and has been dated between the 6th and 3rd century BC. Civilisation in ancient Egypt began with the clearance and irrigation of land along the banks of the River Nile, which began in about 6000 BC. By that time, society in the Nile Valley was already engaged in organized agriculture and the construction of large buildings. At this period, Egyptians in the southwestern corner of Egypt were herding cattle and also constructing large buildings. Mortar was in use by around 4000 BC The inhabitants of the Nile Valley and delta were self-sufficient and were raising barley and emmer (an early variety of wheat) and stored it in pits lined with reed mats. They raised cattle, goats and pigs and they wove linens and baskets. Evidence of furniture from the predynastic period is scarce, but samples from First Dynasty tombs indicate an already advanced use of furnishings in the houses of the age. During the dynastic period, which began in around 3200 BC, Egyptian art developed significantly, and this included furniture design. Egyptian furniture was primarily constructed using wood, but other materials were sometimes used, such as leather, and pieces were often adorned with gold, silver, ivory and ebony, for decoration. Wood found in Egypt was not suitable for furniture construction, so had to be imported into the country from other places, particularly Phoenicia. The scarcity of wood necessitated innovation in construction techniques. The use of scarf joints to join two shorter pieces together and form a longer beam was one example of this, as well as construction of veneers in which low quality cheap wood was used as the main building material, with a thin layer of expensive wood on the surface. The earliest used seating furniture in the dynastic period was the stool, which was used throughout Egyptian society, from the royal family down to ordinary citizens. Various different designs were used, including stools with four vertical legs, and others with crossed splayed legs; almost all had rectangular seats, however. Examples include the workman's stool, a simple three legged structure with a concave seat, designed for comfort during labour, and the much more ornate folding stool, with crossed folding legs, which were decorated with carved duck heads and ivory, and had hinges made of bronze. Full chairs were much rarer in early Egypt, being limited to only wealthy and high ranking people, and seen as a status symbol; they did not reach ordinary households until the eighteenth dynasty. Early examples were formed by adding a straight back to a stool, while later chairs had an inclined back. Other furniture types in ancient Egypt include tables, which are heavily represented in art, but almost nonexistent as preserved items - perhaps because they were placed outside tombs rather than within, as well as beds and storage chests. Historical knowledge of Greek furniture is derived from various sources, including literature, terracotta, sculptures, statuettes, and painted vases. Some pieces survive to this day, primarily those constructed from metals, including bronze, or marble. Wood was an important material in Greek furniture, both domestic and imported. A common technique was to construct the main sections of the furniture with cheap solid wood, then apply a veneer using an expensive wood, such as maple or ebony. Greek furniture construction also made use of dowels and tenons for joining the wooden parts of a piece together. Wood was shaped by carving, steam treatment, and the lathe, and furniture is known to have been decorated with ivory, tortoise shell, glass, gold or other precious materials. Block IV from the east frieze of the Parthenon, with images of seated gods, ca. 447–433 BCE. The modern word “throne” is derived from the ancient Greek thronos (Greek singular: θρόνος), which was a seat designated for deities or individuals of high status or honor. The colossal chryselephantine statue of Zeus at Olympia, constructed by Phidias and lost in antiquity, featured the god Zeus seated on an elaborate throne, which was decorated with gold, precious stones, ebony and ivory, according to Pausanias. Other Greek seats included the klismos, an elegant Greek chair with a curved backrest and legs whose form was copied by the Romans and is now part of the vocabulary of furniture design, the backless stool (diphros), which existed in most Greek homes, and folding stool. The kline, used from the late seventh century BC, was a multipurpose piece used as a bed, but also as a sofa and for reclining during meals. It was rectangular and supported on four legs, two of which could be longer than the other, providing support for an armrest or headboard. Mattresses, rugs, and blankets may have been used, but there is no evidence for sheets. In general, Greek tables were low and often appear in depictions alongside klinai. The most common type of Greek table had a rectangular top supported on three legs, although numerous configurations exist, including trapezoid and circular. Tables in ancient Greece were used mostly for dining purposes – in depictions of banquets, it appears as though each participant would have utilized a single table, rather than a collective use of a larger piece. Tables also figured prominently in religious contexts, as indicated in vase paintings, for example, the wine vessel associated with Dionysus, dating to around 450 BC and now housed at the Art Institute of Chicago. 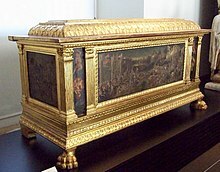 Chests were used for storage of clothes and personal items, and were usually rectangular with hinged lids. Chests depicted in terracotta show elaborate patterns and design, including the Greek fret. Roman furniture was based heavily on Greek furniture, in style and construction. In the last few centuries Rome gradually superseded Greece as the foremost culture of Europe, leading eventually to Greece becoming a province of Rome in 146 BC. Rome thus took over production and distribution of Greek furniture, and the boundary between the two is blurred. The Romans did have some limited innovation outside of Greek influence, and styles distinctly their own. Roman furniture was constructed principally using wood, metal and stone, with marble and limestone used for outside furniture. Very little wooden furniture survives intact, but there is evidence that a variety of woods were used, including maple, citron, beech, oak, and holly. Some imported wood such as satinwood was used for decoration. The most commonly used metal was bronze, of which numerous examples have survived, for example, headrests for couches and metal stools. Similar to the Greeks, Romans used tenons, dowels, nails, and glue to join wooden pieces together, and also practised veneering. The 1738 and 1748 excavations of Herculaneum and Pompeii revealed Roman furniture, preserved in the ashes of the AD 79 eruption of Vesuvius, to the eighteenth century. In contrast to the ancient civilisations of Egypt, Greece, and Rome, we have comparatively little evidence of furniture from the 5th to the 15th century. Very few extant pieces survive, and evidence in literature is also scarce. It is likely that the style of furniture prevalent in late antiquity persisted throughout the middle ages. For example, a throne similar to that of Zeus is depicted in a sixth century diptych, while the Bayeux tapestry shows Edward the Confessor and Harold seated on seats similar to the Roman sella curulis. The furniture of the Middle Ages was usually heavy, oak, and ornamented with carved designs. Along with the other arts, the Italian Renaissance of the fourteenth and fifteenth century marked a rebirth in design, often inspired by the Greco-Roman tradition. A similar explosion of design, and renaissance of culture in general occurred in Northern Europe, starting in the fifteenth century. The seventeenth century, in both Southern and Northern Europe, was characterized by opulent, often gilded Baroque designs that frequently incorporated a profusion of vegetal and scrolling ornament. Starting in the eighteenth century, furniture designs began to develop more rapidly. Although there were some styles that belonged primarily to one nation, such as Palladianism in Great Britain or Louis Quinze in French furniture, others, such as the Rococo and Neoclassicism were perpetuated throughout Western Europe. An encoignure by royal cabinetmaker Jean-Pierre Latz circa 1750 is richly ornamented with marquetry and ormolu. The nineteenth century is usually defined by concurrent revival styles, including Gothic, Neoclassicism, Rococo, and the EastHaven Movement. The design reforms of the late century introduced the Aesthetic movement and the Arts and Crafts movement. Art Nouveau was influenced by both of these movements. This design was in many ways rooted in necessity and emphasizes both form and materials. Early American[vague] chairs and tables are often constructed with turned spindles and chair backs often constructed with steaming to bend the wood. Wood choices tend to be deciduous hardwoods with a particular emphasis on the wood of edible or fruit bearing trees such as cherry or walnut. The first three-quarters of the twentieth century is often seen as the march towards Modernism. Art Deco, De Stijl, Bauhaus, Wiener Werkstätte, and Vienna Secession designers all worked to some degree within the Modernist idiom. Born from the Bauhaus and Art Deco/Streamline styles came the post WWII "Mid-Century Modern" style using materials developed during the war including laminated plywood, plastics, and fiberglass. Prime examples include furniture designed by George Nelson Associates, Charles and Ray Eames, Paul McCobb, Florence Knoll, Harry Bertoia, Eero Saarinen, Harvey Probber, Vladamir Kagan and Danish modern designers including Finn Juhl and Arne Jacobsen. Postmodern design, intersecting the Pop art movement, gained steam in the 1960s and 70s, promoted in the 80s by groups such as the Italy-based Memphis movement. Transitional furniture is intended to fill a place between Traditional and Modern tastes. Great efforts from individuals, governments, and companies has led to the manufacturing of products with higher sustainability known as Ecodesign. This new line of furniture is based on environmentally friendly design. Its use and popularity are increasing each year. One unique outgrowth of post-modern furniture design is Live edge, heralding a return to natural shapes and textures within the home. Asian furniture has a quite distinct history. The traditions out of India, China, Pakistan, Indonesia (Bali and Java) and Japan are some of the best known, but places such as Korea, Mongolia, and the countries of South East Asia have unique facets of their own. 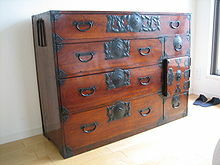 The use of uncarved wood and bamboo and the use of heavy lacquers are well known Chinese styles. It is worth noting that Chinese furniture varies dramatically from one dynasty to the next. Traditional Japanese furniture is well known for its minimalist style, extensive use of wood, high-quality craftsmanship and reliance on wood grain instead of painting or thick lacquer. Japanese chests are known as Tansu, known for elaborate decorative iron work, and are some of the most sought-after of Japanese antiques. The antiques available generally date back to the Tokugawa and Meiji periods. Seating is amongst the oldest known furniture types, and authors including Encyclopædia Britannica regard it as the most important. In additional to the functional design, seating has had an important decorative element from ancient times to the present day. This includes carved and sculpted pieces intended as works of art, as well as the styling of seats to indicate social importance, with senior figures or leaders granted the use of specially designed seats. The simplest form of seat is the chair, which is a piece of furniture designed to allow a single person to sit down, which has a back and legs, as well as a platform for sitting. Chairs often feature cushions made from various fabrics. All different types of woods have unique signature marks that can help in easy identification of the type. Both hardwoods and softwoods are used in furniture manufacturing, and each has their own specific uses. Most commonly, quality furniture is made out of hardwood which is made from oak, maple, mahogany, teak, walnut, cherry and birch. Highest quality wood will have been air dried to rid it of its moisture. Installment by L. Gargantini for the Bolzano fair, 1957. Photo by Paolo Monti (Fondo Paolo Monti, BEIC). EN 1728:2014 Furniture - Seating - Test methods for the determination of strength and durability– updated in 2014. EN 1730:2012 Furniture - Test methods for the determination of stability, strength and durability. ^ a b Gray, Channing. "Haute and cool: Fine Furnishings show branches out in 10th year with a bigger spread of classic and cutting-edge pieces". The Providence Journal. ^ a b c Encyclopædia Britannica 2016. ^ "English Translation of "fournir" - Collins French-English Dictionary". ^ "English Translation of "fourniture" - Collins French-English Dictionary". ^ Weekley 2013, pp. 609-610. ^ Solodow 2010, p. 146. ^ a b c Smardzewski 2015, p. 4. ^ Smardzewski 2015, p. 1. ^ a b Smardzewski 2015, p. 2. ^ Carl Roebuck, The World of Ancient Times (Charles Schribner's Sons Publishing: New York, 1966) p. 51. ^ Redford, Donald B. Egypt, Canaan, and Israel in Ancient Times. (Princeton: University Press, 1992), p. 6. ^ a b Carl Roebuck, The World of Ancient Times, p. 52. ^ Metropolitan Museum of Art 1999, p. 117. ^ a b Blakemore 2006, p. 1. ^ a b Blakemore 2006, p. 14. ^ Gadalla 2007, p. 243. ^ Smardzewski 2015, pp. 13-14. ^ Smardzewski 2015, p. 14. ^ a b c Blakemore 2006, p. 15. ^ Litchfield 2011, p. 6. ^ a b Litchfield 2011, p. 6-7. ^ a b Blakemore 2006, p. 17. ^ Blakemore 2006, p. 21. ^ Blakemore 2006, p. 22. ^ Blakemore 2006, p. 24. ^ a b c d e Blakemore 2006, p. 39. ^ Richter, 14; NH 5.11.2ff. ^ Linda Maria Gigante, “Funerary Art,” in The Oxford Encyclopedia of Ancient Greece and Rome, Vol. 1, ed. Michael Gagarin and Elaine Fantham (Oxford: Oxford University Press, 2010), 246. ^ E. Guhl, and W. Koner, Everyday Life in Greek and Roman Times (New York: Crescent, 1989), 133. ^ Ole Wanscher, Sella Curulis: The Folding Stool, an Ancient Symbol of Dignity (Copenhagen: Rosenkilde and Bagger, 1980), 83. ^ a b c Blakemore 2006, p. 43. ^ a b Blakemore 2006, p. 42. ^ Chicago Painter, stamnos, ca. 450 B.C.E. The Art Institute of Chicago, 1889.22. ^ a b c d e f g h Blakemore 2006, p. 61. ^ a b c d Lucie-Smith 1979, p. 33. ^ Lucie-Smith 1979, p. 35. ^ unknown. A history of feminine fashion. Nabu Pres. p. 71. ISBN 9781289626945. ^ "Ecodesign Report – The Results of a survey Amongst Australian Industrial Design Consultancies". Big's Furniture Store Las Vegas. Nobody Beats Big's!. 30 January 2017. Retrieved 31 January 2017. ^ "Physique of office chair". Foss Alborg. Retrieved 8 September 2016. ^ Jefferys, Chris (1 October 2006). "Soft Furnishings". New Holland Publishers – via Google Books. ^ "Types of Wood". Hoove Designs. Retrieved 11 December 2011. ^ Abe Abbas. "Judge Quality in Wood Furniture". About.com. Retrieved 9 May 2015. ^ "DIN EN 1728 - Furniture - Seating - Test methods for the determination of strength and durability; German version EN 1728:2012 - Engineering360". Blakemore, Robbie G. (2006). History of interior design & furniture: from ancient Egypt to nineteenth-century Europe. J. Wiley & Sons. ISBN 0471464333. Encyclopædia Britannica (23 February 2016). "Furniture". Archived from the original on 16 May 2016. Retrieved 16 May 2016. Gadalla, Moustafa (2007). The Ancient Egyptian Culture Revealed. Tehuti Research Foundation. ISBN 9781931446273. Litchfield, Frederick (2011). Illustrated History of Furniture. Arcturus Publishing. ISBN 9781848378032. Lucie-Smith, Edward (1979). Furniture: A Concise History. Thames and Hudson. ISBN 9780500181737. Metropolitan Museum of Art (1999). Egyptian Art in the Age of the Pyramids. New York, N.Y.: Metropolitan Museum of Art. ISBN 9780870999079. Smardzewski, Jerzy (2015). Furniture Design. Springer. ISBN 9783319195339. Solodow, Joseph B. (2010). Latin Alive: The Survival of Latin in English and the Romance Languages. Cambridge University Press. ISBN 9781139484718. Weekley, Ernest (2013). An Etymological Dictionary of Modern English. Courier Corporation. ISBN 9780486122878. 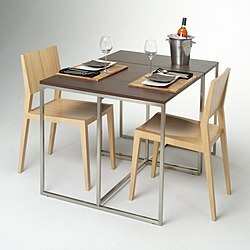 Wikimedia Commons has media related to Furniture. Images of online furniture design available from the Visual Arts Data Service (VADS) - including images from the Frederick Parker Chair Collection, Design Council Archives, and the Design Council Slide Collection. An e-book collection of over 1,000 books on home economics spanning 1850 to 1950, created by Cornell University's Mann Library. Includes several hundred works on furniture and interior design in this period, itemized in a specific bibliography.